Eighty years have passed since the Planet Omni was settled by people from Earth to stem the mounting problem of overpopulation. Now in the year 2540, a war has broken out between the two planets over Omni's independence. The primary heroines of this two-episode series are all pilots of the DoLLS (Detatchment of Limited Line Service). 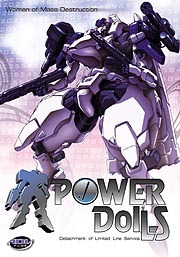 The DoLLS are technologically advanced battle mechs designed to halt the Terran invasion. Music isn't lacking in quality, though the styles chosen aren't quite relevant to the sci-fi setting of the show. This is a war story, and when the fleet of DoLLS is deployed, jazzy, horns-laden tunes thump along merrily in the background. I can dig jazz, but I remain unconvinced that elevator music is appropriate for the start of a sortie. I did like the second episode's opening theme song, 'Heaven' by Kaori Moriwaka, but that was the aural highlight of the series. This disc was priced lower than other DVDs, but with the short running time (an hour), that's to be expected. It's a good thing that the disc is cheaper than others, however, because I would feel bad if I had paid too much for this one. I tend to be very easy to please when it comes to movies or books. However, this series never really goes anywhere, and while I can't exactly blame it due to its brevity, I also can't really enjoy it. Watching these two episodes was like watching the trailer of something that could've been far greater. There's an interesting back story, characters that suggest a greater depth than is gleaned from the brief time we see them, and passable if not outstanding production values. Potential doesn't make a series good, and these two OVAs never do much more than hint that they could have been better. The enemies are almost completely faceless, save for the two primary foes in the second episode. We only scratch the surface of the interplanetary civil war going on with the humans fighting for Omni and Earth, and overall, I was rather disappointed. Yao Fei Lun, Lieutenant Commander for the DoLLS, is the main character in both episodes, though the two episodes differ slightly in their presentation of the woman. Again, like the rest of the series, she could've eventually been a well-rounded character, but she's introduced and gone so quickly, she ends up being forgettable. The back of the box is rather misleading, promising much more than the show actually delivers, though given the content the marketing people had to work with, I can understand why. Regardless, Power DoLLS isn't quite the explosive action-fest the packaging suggests it to be. Actually, it's not even set in the 25th Century, but rather the 26th, though that's a minor detail. The box claims that Power DoLLS contains "heavy metal mayhem," but it's closer to Muzak than Metal. The voice acting was average, and I can safely say it wasn't poor acting that made this a bad series. There just wasn't enough of a series to classify as good or bad. The subtitles had a few typos, though they were simple ones such as substituting "through" for "thoroughly". This wasn't the top release of 2003, and I'd say there are hundreds of other titles out there that are far more worthy of your time. However, if you live and die for mechs, then this series has 'em. In fact, that's about all it has. Well, I guess there is the jazzy battle music. So, jazz and mechs: if that's all you need, this is for you.